Februar 2016 – Master planner Andreas Walter, who is responsible for the reconstruction of the University Hospital Bern (Switzerland), has developed an innovative approach to hospital planning which is unique: All planning decisions are uncompromisingly based on broad-scale patient data of the hospital and not on traditional clinical, hierarchical or other considerations. The large data pool of the hospital has been used and transformed into a graphic model which indicates where the patients were examined or treated in the past and where they were transferred to, etc. Each movement is displayed as a “timestamp” in this graph which results in a cobweb-like structure with fine and broad lines showing the most frequently used pathways. This shows for example, which departments should be located close together in one building and which can be located further away. Most of the clinical directors and senior physicians in the hospital agreed with this concept, despite the fact that it may result in less space or a less prominent location for their own department. The concept of focusing on patients, their movements and the clinical workflows, is also a unifying factor for the whole hospital. 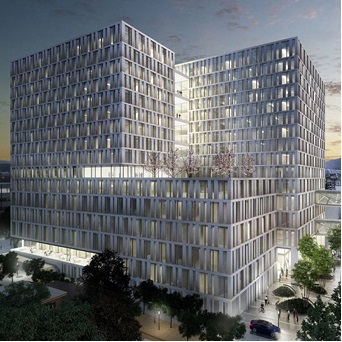 The University Hospital Bern made decisions for investments in several million CHF based on this new concept. Now, after 4 years of planning, it is obvious that the new strategy is as successful as predicted. Andreas Walter assumes that other hospitals will follow in adopting this approach. Hospitals in Berlin, Göttingen, Munich and Dubai have already invited Andreas Walter to present this new concept. From the start of this planning process MMI has been a key player and will continue to promote this new data centered approach of hospital planning.